Today is my birthday. Yesterday was my husband’s. So, I made a cake. This is only the second time in my entire life that I baked a cake from scratch. 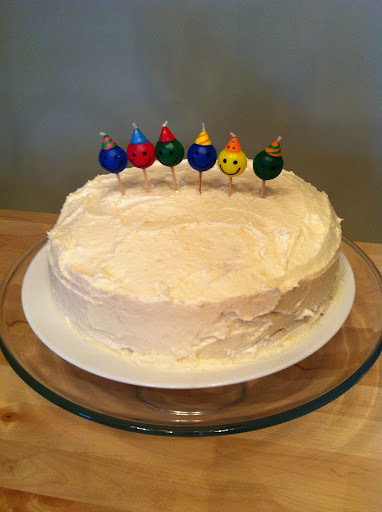 The first time was when I baked one for our birthdays last year. I felt such a huge sense of accomplishment that I put baking a cake on my Runaway Mama Bucket List. I don’t know why it took me a year to make another one, but she looks yummy, doesn’t she? Turning 35 last year was a big deal for me (you can read my 35th birthday blog post here),but turning 36 feels a little bit like turning 19 and being stuck between epic 18 and monumental 21. My next epic birthday will be 40, which also happens to be the year of my next colonoscopy, and that will be monumental in a much different way. Thankfully, I have a few (hopefully )uneventful birthdays to distract me. Uneventful isn’t a bad thing. (It sure beats the colonoscopy prep.) I’m grateful to not be as emotional as I was last year and to be able to focus on the lighter – cakier – side of the day. I want to thank everyone who has wished me a happy birthday, including my family, friends, the Facebook universe and some unexpected well-wishers. I need to give a shout out to DSW for sending me a $5 coupon to use any time during the month of September. Oh, how I’d love a pair of bootie wedges! Also, CVS gave me a $2 extracare/coupon for my birthday. Kind of boring, but still a nice gesture. Just this morning, Piperlime.com sent me a surprise email with a coupon for $15 off my next $60 purchase. I love surprises! Even Wells Fargo knows it’s my birthday. Every time I visit an ATM, it wishes me a happy birthday month. Instant smile maker! Even with all this birthday love, I have to get something off my chest. There’s one well-wisher that is notably missing from this year’s flood of messages, calls, cards and gifts, and I must admit my feelings are hurt. I’m referring to Anthropologie, the ubiquitous women’s clothing retailer with one-of-a-kind prints, perfect dresses and blouses that can scratch almost any shopaholic itch. I can’t remember a birthday when they didn’t send me a birthday coupon for 15% off my entire purchase in September. Truthfully, it always seemed a little bit cheap considering the average cost of a shirt there is $78, but it was the only coupon they sent out all year and I looked forward to it. It’s all cool and yellow, and it originally came in a darling demin pouch, but it’s worthless. Every time I walk in their store and make a purchase the equivalent of a mortgage payment, I throw down my Anthro card expecting some kind of future shopping reward – like a $10 or 20% off coupon– to show up in the mail. Let me tell you, it never comes. (They could learn a lot from retailers like Toys R Us, Best Buy, Nordstrom and The Gap.) 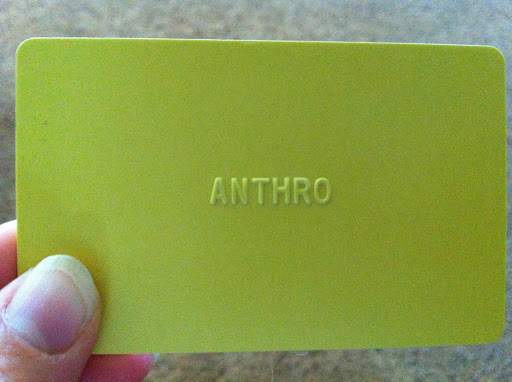 I’m starting to think every time they swipe my Anthro card, an executive at Anthropologie’s headquarters does a shot or throws a dart at a security camera photo of me instead of calculating points or dollars spent. And now they forgot my birthday. I give and give and give (spend and spend and spend) and never get anything in return. I wish I could tell you I’m strong enough to end this toxic relationship, but I received some birthday money from my parents (thanks Mom and Dad!) and all I want to do is go to Anthropologie. I’m not proud of this, but at the tender age of 36, I still have a lot to learn. I sure hope 40 brings with it some wisdom for this incurable shopaholic.